Mark Quantock, a 37-year military veteran and former National Geospatial-Intelligence Agency official, has been appointed executive vice president of strategic accounts at data analytics firm Babel Street. 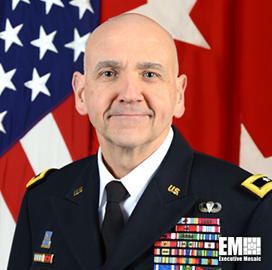 In his new role, the retired U.S. Army major general will work with customer-facing teams to expand the company’s portfolio to military, government and commercial sector clients, Babel Street said Thursday. Prior to joining the company, Quantock held various positions, such as director of operations and military deputy director at the NGA and director of intelligence/J2 for the U.S. Central Command. Throughout his military career, Quantock worked on signals and all-source intelligence efforts in addition to serving across senior leadership roles during four deployments to the Middle East and South Asia. "We are thrilled to welcome Mark to the Babel Street tribe and look forward to his unique insights that will no doubt fuel new opportunities for us and our clients,” said Babel Street CEO Jeffrey Chapman. Babel Street is a Reston, Va.-based firm that provides multilingual search and analytics software offerings to public and private sector customers.